Hello, dear students! Hope your exam was fine. Bangladesh Madrasah Education Board Dakhil Result 2017 Details Will Found here. In this article, I am going to share Dakhil Result 2017 for Bangladesh Madrasah Education Board of Bangladesh. Dakhil is the another program of Madrasah student. Before attending Dakhil exam, every student must need to complete class 9 and class 10 under the Madrasah Board. This is the same level program of Secondary School Certificate. It is another biggest public examination in Bangladesh of Madrasah board. Dakhil Exam Result 2017 will publish on 4th May 17. Every year a big number of Madrasah's students are attending Dakhil examination. Today I am sharing how to get Dakhil Exam Result 2017 by officially Bangladesh Madrasah education board (www.bmeb.gov.bd). This is not hard to get your result. You can easily collect your Dakhil result 2017 by following some easy steps. After passing of Junior Dakhil exam, every Madrasah student can attend the Secondary program. After complete their class 9 and 10 studies, a student can attend on Dakhil Exam under the Madrasah board. After that student is looking for how to get their Dakhil Exam Result 2017. Don't worry. In this post, I am sharing all official methods for collecting Madrasah Board Dakhil Result 2017. You can collect the following result through Internet, Mobile SMS and Android apps. Now let me discuss all methods for getting your result. Dakhil and SSC are same examinations in Bangladesh. Dakhil Result will publish at the same time of SSC Exam Result 2017. So, never tension about your result. In this post, I am showing you how to get Dakhil Result 2017 by online. 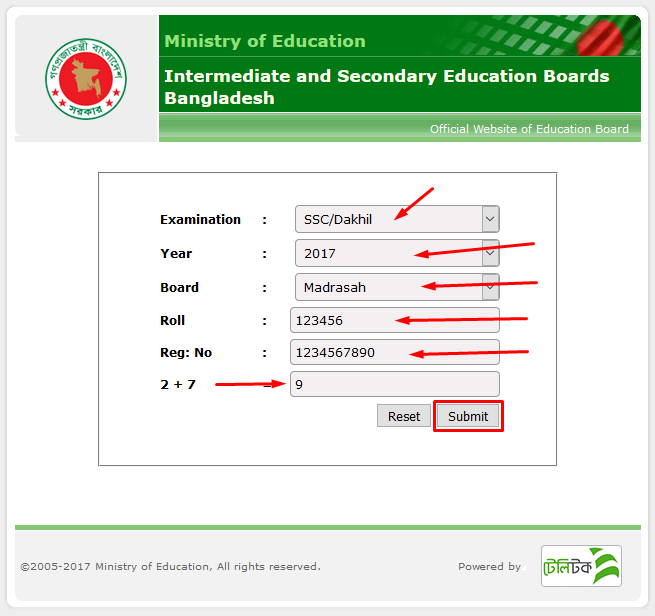 You know guys, Online is the most popular way for getting any result with mark sheet of Bangladesh Education Board. Another 2 methods are also available for getting Dakhil Exam Result. 1stly Go to the following link: http://www.educationboardresults.gov.bd. This is the official website of Bangladesh Ministry of Education Board. Then hit on Submit button. Wait few seconds. Your result will appear on another page. You should check below screenshot. Mobile SMS is the another popular way for collecting their education board result. Bangladesh is a developing country. In our country maximum students are poor. They have no any internet connection or they are live in the village. That's why they not able to collect their Dakhil Exam Result 2017 by Online internet. For these students, Mobile SMS is the best way for collecting their result and it not costly. A student can send a message for 1.65BDT with SD and VAT. So now let see how to send a message for collecting your result. 1stly go to message option and type DAKHIL now give a space and type MAD again give a space and type your Roll Number and give again space and type Passing year as 2017 now send it to 16222 Number. This SMS system powered by Teletalk Bangladesh Limited. Hope you understand about full SMS format of Dakhil Result 2017. If you want to collect your result through SMS, then try above format from any operator of Bangladesh. If you try from Teletalk operator you may found your result quickly and fast. If you face any problems or if you have a question about Dakhil result 2017 then immediately leave a comment on the comment section. I recommended you, wait until the result publishes officially. Once the result publishes then try to collect your result after 2:00 PM by online. You should also collect your result from your own institute fast and quickly. Wish you best of luck. Thank you. Share the post "Dakhil Result 2017 Madrasah Board bmeb.gov.bd"